An Alfonso Azpiri illustration from this Zizki page. 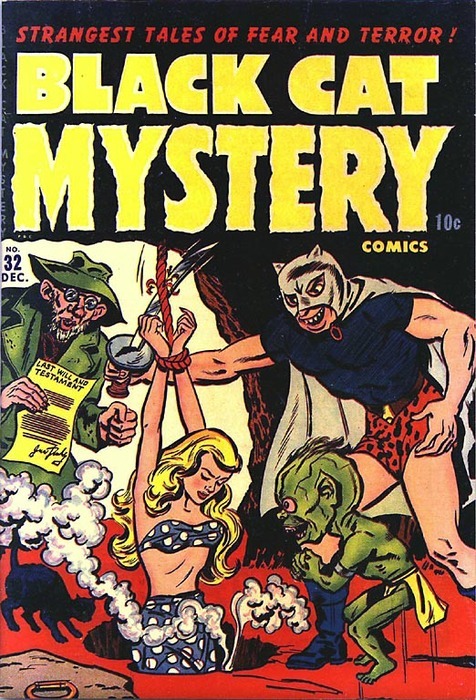 This is the cover from a series called Black Cat Mystery Comics, Issue #32, published December 1951. I hesitate to imagine what that poor girl is about to be plunged into. (A hot spring? Hell itself?) Details on the issue are thin, but there’s an entry for in in the Grand Comics Database here. This image is a reblog from a 16 November 2013 post at Infernal Wonders, itself originally picked up from the now sadly defunct tumblr Great Grotto. My original tumblr post was here. 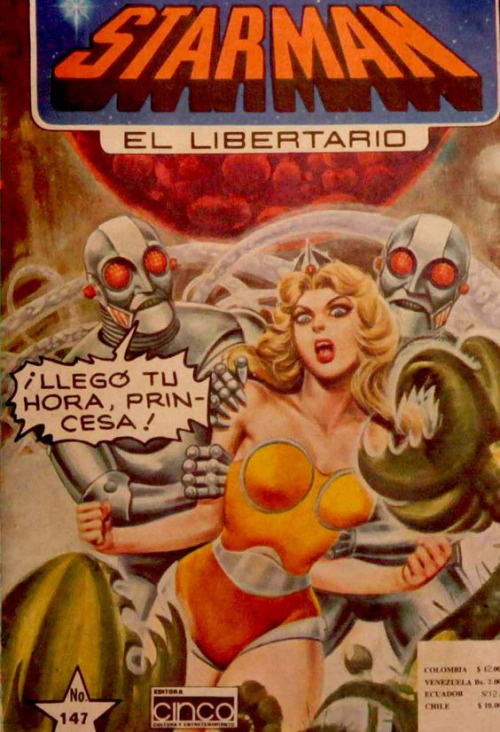 This is the cover for issue #147 of Starman a Mexican comic book series that ran between 1978 and 1982 (?). Our endangered heroine looks a bit like a pulp-comic version of Princess Peach, although since the latter didn’t appear until 1985, probably isn’t. The image was first posted on Tumblr by Good Girl Art and comes to us via inkycurves. My original tumblr post was here. 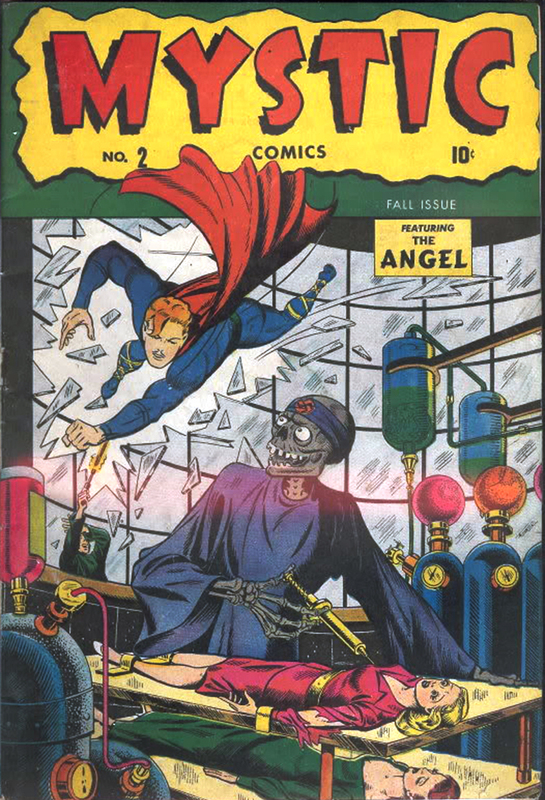 This is the Fall 1944 issue of Mystic Comics. The Grand Comics Database entry for the series is here. It was first posted on Tumblr by Damsel Lover. 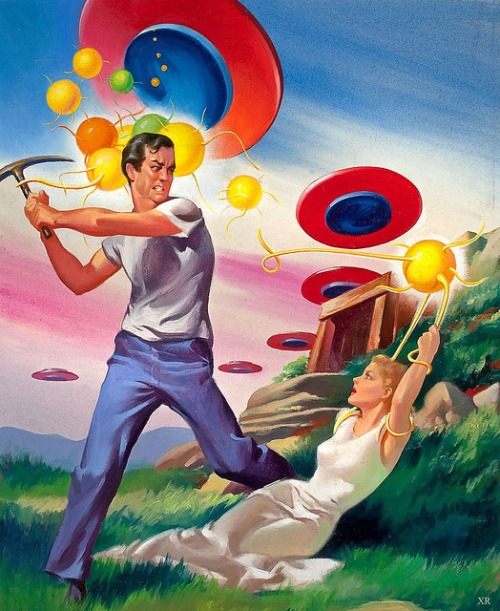 Tumblr favorite #2555: Curse you, Martian mad scientist! My original tumblr post was here. 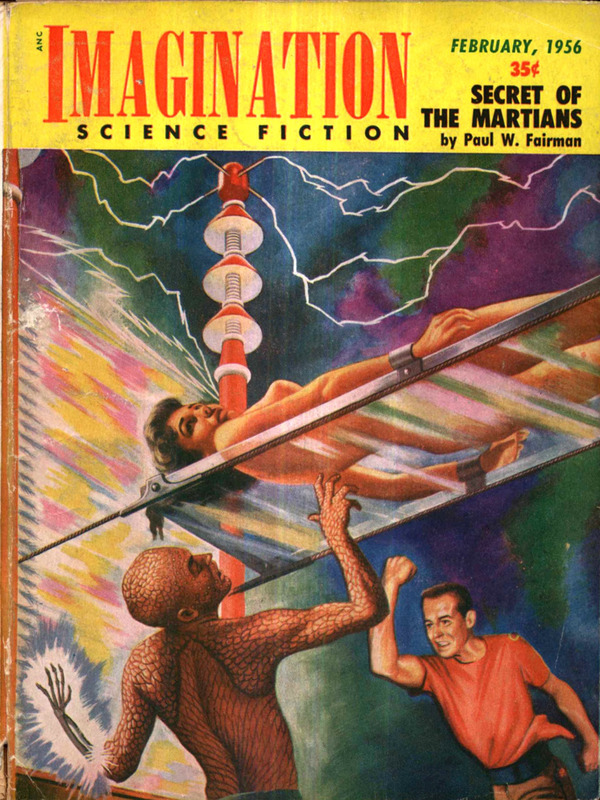 This cover image of the February 1956 issue Imagination Science Fiction was originally posted on Tumblr by pulpbizzare with the enigmatic (to me, anyway) text “3641-1852-10939.” It comes to us via Reginald Juice. The ISFDB entry for this issue is here, and identifies the artist as Lloyd Rognan. My original tumblr post was here. 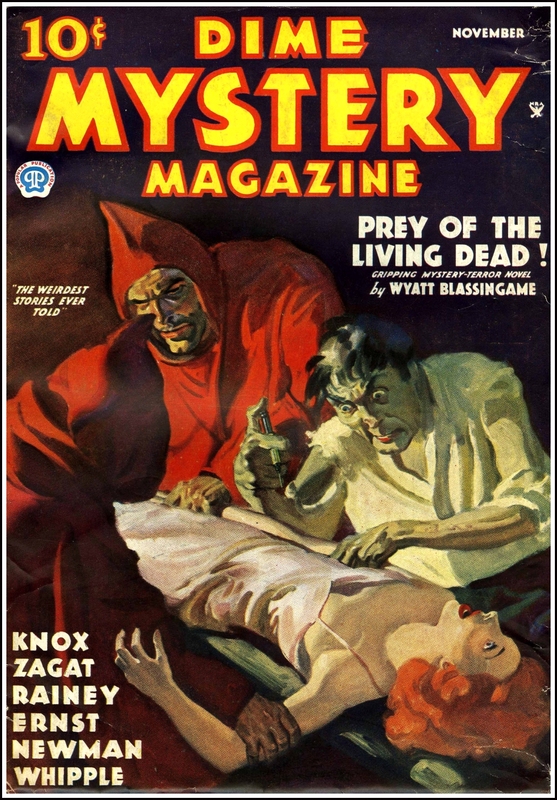 This cover image of the November 1935 edition of Dime Mystery Magazine was first posted on Tumblr by Damsel Lover. The ISFDB entry for the issue is here. My original tumblr post was here. This image by Harold McCauley was initially posted by X-Ray Delta One on Flickr, was reposted on tumblr by johnnythehorse and comes to us via mudwerks. My original tumblr post was here. 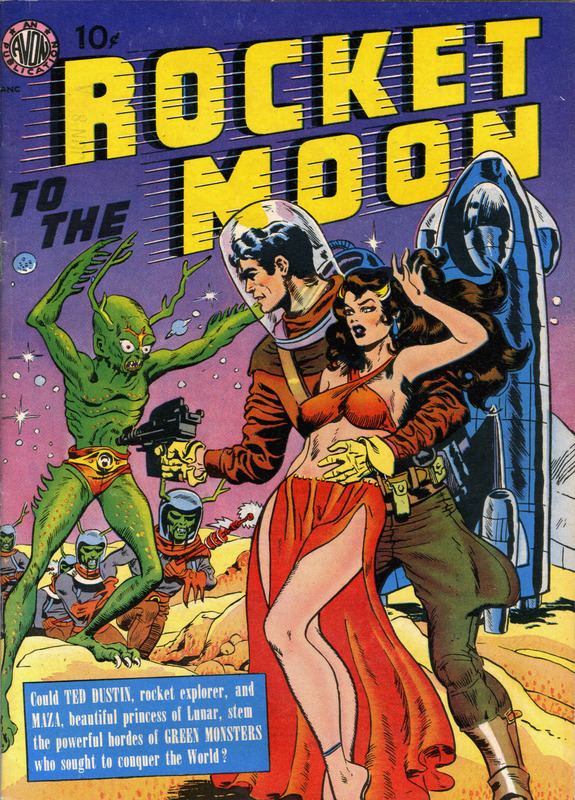 This comics cover “Rocket to the Moon” features the text “Could TED DUSTIN, rocket explorer, and MAZA, beautiful princess of Lunar, stem the powerful hordes of GREEN MONSTERS who sought to conquer the World?” It was originally posted by brudesworld who attributed it to “Joe Orlando, 1951.” My snarky comment in reply was “Hell, if you’re pretty enough you don’t need any spacesuit, apparently.” The image comes to us via notpulpcovers. My original tumblr post was here. This image is The Mad Scientist by kryptik0.